Tempel is excited to announce the “soft-launch” of our new website Tempel.com! This site has been designed with feedback from our current and potential customers, as well as input from a cross-functional team of employees at varying levels across the enterprise. Because more than 25 percent (this number is expected to continue rising!) of our Tempel.com users visit the site using a mobile device, we’ve designed the new site to be mobile-first. Mobile-first implements the best strategy and designs for making web sites work on every device (phone, tablet, laptop, etc. ), leading to a design that is more content and user-focused. 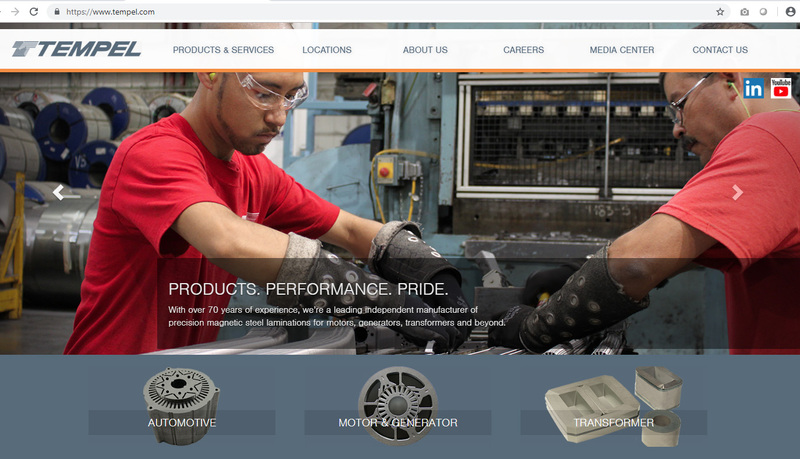 The new site gives web visitors an easier way to learn about who we are, what we do and how our products, services and many capabilities offered at our facilities can meet their needs. It also includes larger, brighter photos and an easy to read navigation. In addition, we’ve brought all facility content together – each facility now has their own feature page that highlights the location’s related news, certifications, videos and even contact information in one place. The site contains integrated social media buttons for LinkedIn and YouTube to foster improved communication with customers and fellow employees. Additionally, accessing videos and news related to specific facilities and capabilities is now easy to access in the Media Center, as well on the page of our market groups and facilities. Tempel makes a difference in the world we live in everyday with our products and services. We also make the extra effort to give back to our communities and reduce our carbon footprint. Our new website highlights these efforts. Our work on the new site is not over yet! During the next few months we will be rolling out more exciting and helpful functionality. We will let you know when other features and enhancements become available.